Recently there has been an increased focus on investigating whether several natural compounds, collectively known as nutraceuticals, may exert neuroprotective actions in the aging nervous system. Quercetin and its variants such as isoquercetin have received the most attention in this regard. As mentioned in other articles here, quercetin and isoquercetin and other variants of the polyphenol share the same effects only the bioavailability varies. Several studies in vitro, in animals and in humans, have provided supporting evidence for the neuroprotective effects of quercetin, either against neurotoxic chemicals or in various models of neuronal injury. It is as yet not completely clear how such protective mechanisms work, though there are a number of hypotheses as to how this happens. In addition to the antioxidant effect, quercetin may also stimulate cellular defenses against oxidative stress. Two potential pathways include the induction of the antioxidant/anti-inflammatory enzyme paraoxonase 2 (PON2) and Nrf2-ARE. In addition, quercetin has also been shown to activate sirtuin, in particular SIRT1, to induce autophagy which may provide neuroprotection. A study in 2005 investigated a host of natural compounds for their neuroprotective potential (1). Beta-amyloid is a well known factor contributing to Alzheimer’s disease due to its oxidative toxicity on neuronal cells which occurs after fibril formation. The team evaluated 214 compounds including flavones, curcuminoids and naphthoquinones during the study to see if any of them had neuroprotective effect. Curmuminoids, curcumin, demethoxycurcumin, and bisdemethoxycurcumin were shown to inhibit beta-amyloid fibril formation. However curcuminoids were shown to be cytotoxic (toxic to cells) and did not protect HT22 murine neuroblastoma cells from beta-amyloid oxidative damage. Interesting flavonoids including quercetin and morin were demonstrated to have a potent inhibitory effect on Beta-amyloid fibril formation and displayed no cytotoxicity. Even more interesting they gave strong protection to HT22 murine neuroblastoma cells from beta-amyloid oxidative damage. This study suggests that quercetin could be valuable in the development of therapeutics for Alzheimer’s disease. A 2006 study looked at quercetin and its metabolite quercetin 3-glucuronide as mediators of oxidative stress in the central nervous system (2). The team measured 13-hydroperoxy octadecadienoic acid (13-HPODE) in pheochromocytoma (a usually non cancerous tumor) PC-12 cells when exposed to quercetin 3-O-beta-glucuronide and related substances. The results showed that the various forms and metabolites of quercetin were all able to suppress the formation of reactive oxygen species (ROS) in pheochromocytoma PC-12 cells. Their results suggest that the antioxidative metabolites of quercetin are capable of protecting nerve cells from the attack of lipid hydroperoxide resulting from the increased levels of reactive oxygen species. Interestingly quercetin has been shown to protect against the neurotoxicity induced by metals such as lead, methylmercury, and tungsten (6-8). Neurotoxicity induced by insecticides endosulfan and MPTP has also been shown to be reduced by quercetin in a number of in vivo studies (9-11). High doses of quercetin were also shown to reduce the cognitive impairment induced by feeding mice a high fat diet (12). The higher dose reversed cognitive decline completely in the mice which is interesting as a low dose actually had prooxidant effects which impaired cognition. This suggests that there is a dosage threshold that turns it from prooxidant to antioxidant and thus it becoming protective, certainly the amounts present in supplements are equivalent to the higher doses used with these mice. In a 2014 study researchers showed it was neuroprotective in a rat model of intracerebral hemorrhage (13). These results confirmed the therapeutic efficacy of quercetin in repairing brain injury, by inhibiting the inflammatory response and apoptosis of healthy brain cells. A more recent study in 2015 with rats showed quercetin also protected the retina from damage due to ischemia-reperfusion injury (14). The researchers concluded that the use of quercetin may be beneficial in the treatment of retinal ischemia-reperfusion injury due to its antiapoptotic effect on the retinal cells. There are also some recent findings from a 2015 study that showed that quercetin was able to ameliorate Alzheimer’s disease pathology and cognitive impairment in an Alzheimer transgenic mouse model (15). It is also very interesting to note that a combination of quercetin and fish oil taken orally improved neuroprotection in rats exposed to 3-nitropropionic acid or chronically exposed to the insecticide rotenone (16-17). Another way quercetin is believed to enhance neuroprotection is by its ability to reduce oxidative stress. Oxidative stress is an important factor in a number of neurodegenerative diseases, as a regulator of neurotoxicants and as a mechanism involved in age-related degeneration (18-19). Oxidative stress happens when reactive oxygen species (ROS) accumulate in cells, this is due to there either being excessive production or insufficient neutralization of their numbers. 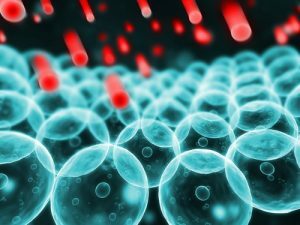 This leads to damage to proteins, lipids and DNA as the reactive oxygen species hurtle around inside the cell striking and damaging its components. The mitochondria are a significant creator of ROS in cells and produce them as a normal byproduct of energy generation (ATP). ROS produced by the mitochondria can damage the electron transport chain, resulting in a downward spiral where ROS increases, followed by loss of ATP and then cell death (20). As a result of this chain of events, the identification of compounds able to help counteract oxidative stress are of particular interest to researchers as potential therapies. Indeed quercetin and other polyphenols have been extensively investigated (21). Quercetin has been shown in studies to be a powerful scavenger of reactive oxygen species and also reactive nitrogen species (22). The reason why quercetin is so effective at scavenging free radicals is due to the presence of two pharmacophores within the molecule that allow optimal free radical scavenging (23). In vitro studies show that a dosage of 5 to 50 μM allows quercetin to directly scavenge ROS (24). However, despite this potent antioxidant effect of quercetin in vitro, it is unlikely that the neuroprotective effects of quercetin are due to direct antioxidant action. It is considerably more likely that quercetin and its variants activate the cells own antioxidant defence mechanisms (25-26). So really this suggests that quercetin is not an antioxidant per se and could really be considered a prooxidant, as a small amount of oxidative stress may activate the cell’s own antioxidant defence system, thus resulting in cell protection (27-28). As mentioned previously, quercetin appears may be a prooxidant and there is evidence to support that it has a role in hormesis by creating small amounts of mitochondrial and membrane oxidative stress (29). Hormesis is a biological phenomenon where a beneficial effect (improved health, stress tolerance or longevity) results from exposure to a low doses of a substance that is otherwise toxic or lethal when given at higher doses. Interestingly this hormesis reaction from quercetin may also include preconditioning, this is when exposure to a low dose of a substance normally toxic at high doses induces an adaptive response from the body, meaning over time there is a potentially beneficial effect on the cell even when subsequently exposed to much higher doses of the same substance (30). Paraoxonase 2 (PON2) is a lactonase and a member of the paraoxonase family of genes (31). PON2 also has an important role in the development of atherosclerosis (32). PON2 is found in a variety of species including, mice, rats, monkeys and humans and is expressed all over the system. PON2 has been demonstrated to have an antioxidant effect, and is suggested to play a major role in preventing the development of atherosclerosis and also in a neuroprotective role (33-35). Females in various species also tend to have more PON2 than males. The location of PON2 in the mitochondria strongly suggests that this enzyme has a role in protecting the cell from oxidative damage, indeed PON2 deficiency causes mitochondrial dysfunction (36). It is also interesting that the mitochondria, nucleus and cytoplasm are all areas of prefered accumulation for quercetin within the cell (37). We also know from experiments using human endothelial cells that PON2 can reduce the release of superoxide from the inner mitochondrial membrane (38). PON2 deficiency in mice gives rise to increased levels of the oxidants, hydrogen peroxide (H2O2) and 2,3-dimethoxy-1,4-naphthoquinone (DMNQ) as seen in PON2 knockout mice (39). Confirming this, striatal astrocytes and neurons in male mice have low PON2 levels making them more vulnerable to H2O2 and DMNQ oxidative stress when compared to female mice (40). This strongly suggests a neuroprotective action for PON2. A large number of substances have been shown to increase PON2 activity in multiple cell types, including quercetin (41). As we talked about earlier in this article, quercetin may increase antioxidant activity by creating low level oxidative stress thus provoking a defensive antioxidant response from the cell (42). As an example of this, PON2 expression is shown to increase in macrophages when exposed to oxidative stress (43). Quercetin increased PON2 mRNA and protein levels in macrophages in vitro, however, in a six week trial humans taking 150 mg/day (a relatively low dose compared to the 500 mg/day typical of supplements) failed to produce the same effects (44). The effect of quercetin is antagonized by the inhibitor SP600125 which inhibits the JNK/AP-1 pathway, so it appears that quercetin may indeed induce low level oxidative stress (45). This in turn likely activates the JNK/AP-1 pathway increasing the level of PON2 expression in the cell (46). Another possible way quercetin may increase PON2 expression is via its phytoestrogen activity (47). Phytoestrogens like quercetin have been shown to upregulate PON2 activty in various studies. So PON2 upregulation may likely be one way in which quercetin induces the body to generate an antioxidant response thus leading to cytoprotective benefits. The [nuclear factor (erythroid-derived 2)-like 2] is a key regulator of the cell’s defense response against the presence of oxidative stress. Under normal conditions Nrf2 is isolated in the cytoplasm by the protein Keap1 (Kelch-like ECH-associated protein 1) with Cullin 3-base E3 ligase which keeps it dormant (48). Keap1 reacts to reactive oxygen species by releasing Nrf2 (49). Once released Nrf2 moves to the nucleus where it bonds with small Maf proteins, this combined molecular complex (a heterodimer) then binds to antioxidant response elements (ARE) causing the cell to produce antioxidants (50-51). The proteins regulated by the Nrf2-ARE pathway include heme oxygenase-1, glutamate cysteine ligase, glutathione S-transferases, glutathione peroxidase, superoxide dismutase, catalase, sulfiredoxin, and thioredoxin. Quercetin has been shown to be able to counteract oxidative stress induced damage to the cell via the Nrf2-ARE pathway (52-53). Interestingly Pterostilbene has been shown to have a synergistic effect with quercetin for activating Nrf2 too (54). The ERK and JNK signalling pathways are linked to activation of Nrf2 and quercetin has an established role in this (55). Both of these pathways are in turn activated by stress such as mild oxidative stress, this suggests that quercetin once again is a mild prooxidant that provokes an antioxidant response from the cell (56). Autophagy (from the Ancient Greek αὐτόφαγος autóphagos, meaning “self-devouring” and κύτος kýtos, meaning “hollow”) is a cellular process that delivers dysfunctional cell components (misfolded proteins, cellular metabolic waste) to the lysosomes for disposal. The lysosomes are organelles found in nearly all animal cells which contain hydrolytic enzymes that can break down most kinds of biomolecules, they can be considered the garbage disposal system of the cell. Autophagy also removes damaged mitochondria and is responsible for turnover in a process called mitophagy. The central nervous system relies on autophagy, as damaged organelles and misfolded proteins would otherwise accumulate in neurons unless removed (57). Quercetin has been shown to mitigate the cell damage caused to Schwann cells from high glucose by inducing autophagy (58). Quercetin has also been shown to increase autophagy in cancer cells in various studies (59-61). There is a rising interest in the potential of quercetin, isoquercetin and other polyphenols for neuroprotection. We have touched upon some of the more important studies and mechanisms in relation to quercetin and its ability to reduce oxidative stress, its apparent paradox as a prooxidant and some of the other possible mechanisms for neuroprotection. Whilst more research can and should be done to discover the exact mechanisms and pathways quercetin uses the evidence so far is very interesting indeed. This is one reason why quercetin, isoquercetin and its variants is perhaps one of the most interesting and useful compounds in the natural world. (3) Ossola, B., Kääriäinen, T. M., & Männistö, P. T. (2009). The multiple faces of quercetin in neuroprotection. Expert opinion on drug safety, 8(4), 397-409. (4) Ishisaka, A., Ichikawa, S., Sakakibara, H., Piskula, M. K., Nakamura, T., Kato, Y., … & Terao, J. (2011). Accumulation of orally administered quercetin in brain tissue and its antioxidative effects in rats. Free Radical Biology and Medicine, 51(7), 1329-1336. (5) Das, S., Mandal, A. K., Ghosh, A., Panda, S., Das, N., & Sarkar, S. (2008). Nanoparticulated quercetin in combating age related cerebral oxidative injury. Current Aging Science, 1(3), 169-174. (6) Hu, P., Wang, M., Chen, W. H., Liu, J., Chen, L., Yin, S. T., … & Ruan, D. Y. (2008). Quercetin relieves chronic lead exposure-induced impairment of synaptic plasticity in rat dentate gyrus in vivo. Naunyn-Schmiedeberg’s archives of pharmacology, 378(1), 43-51. (7) Barcelos, G. R. M., Grotto, D., Serpeloni, J. M., Angeli, J. P. F., Rocha, B. A., de Oliveira Souza, V. C., … & Knasmüller, S. (2011). Protective properties of quercetin against DNA damage and oxidative stress induced by methylmercury in rats. Archives of toxicology, 85(9), 1151-1157. (8) Sachdeva, S., Pant, S. C., Kushwaha, P., Bhargava, R., & Flora, S. J. (2015). Sodium tungstate induced neurological alterations in rat brain regions and their response to antioxidants. Food and Chemical Toxicology, 82, 64-71. (9) Bavithra, S., Selvakumar, K., Kumari, R. P., Krishnamoorthy, G., Venkataraman, P., & Arunakaran, J. (2012). Polychlorinated biphenyl (PCBs)-induced oxidative stress plays a critical role on cerebellar dopaminergic receptor expression: ameliorative role of quercetin. Neurotoxicity research, 21(2), 149-159. (10) Lv, C., Hong, T., Yang, Z., Zhang, Y., Wang, L., Dong, M., … & Meng, Y. (2012). Effect of quercetin in the 1-methyl-4-phenyl-1, 2, 3, 6-tetrahydropyridine-induced mouse model of Parkinson’s disease. Evidence-Based Complementary and Alternative Medicine, 2012. (11) Lakroun, Z., Kebieche, M., Lahouel, A., Zama, D., Desor, F., & Soulimani, R. (2015). Oxidative stress and brain mitochondria swelling induced by endosulfan and protective role of quercetin in rat. Environmental Science and Pollution Research, 22(10), 7776-7781. (12) Xia, S. F., Xie, Z. X., Qiao, Y., Li, L. R., Cheng, X. R., Tang, X., … & Le, G. W. (2015). Differential effects of quercetin on hippocampus-dependent learning and memory in mice fed with different diets related with oxidative stress. Physiology & behavior, 138, 325-331. (13) Zhang, Y., Yi, B., Ma, J., Zhang, L., Zhang, H., Yang, Y., & Dai, Y. (2015). Quercetin promotes neuronal and behavioral recovery by suppressing inflammatory response and apoptosis in a rat model of intracerebral hemorrhage. Neurochemical research, 40(1), 195-203. (14) Arikan, S., Ersan, I., Karaca, T., Kara, S., Gencer, B., Karaboga, I., & Hasan Ali, T. (2015). Quercetin protects the retina by reducing apoptosis due to ischemia-reperfusion injury in a rat model. Arquivos brasileiros de oftalmologia, 78(2), 100-104. (15) Sabogal-Guáqueta, A. M., Muñoz-Manco, J. I., Ramírez-Pineda, J. R., Lamprea-Rodriguez, M., Osorio, E., & Cardona-Gómez, G. P. (2015). The flavonoid quercetin ameliorates Alzheimer’s disease pathology and protects cognitive and emotional function in aged triple transgenic Alzheimer’s disease model mice. Neuropharmacology, 93, 134-145. (16) Joseph, K. D. (2013). Enhanced neuroprotective effect of fish oil in combination with quercetin against 3‐nitropropionic acid induced oxidative stress in rat brain. Progress in Neuro-Psychopharmacology and Biological Psychiatry, 40, 83-92. (17) Joseph, K. D. (2015). Combined oral supplementation of fish oil and quercetin enhances neuroprotection in a chronic rotenone rat model: relevance to Parkinson’s disease. Neurochemical research, 40(5), 894-905. (18) Lin, M. T., & Beal, M. F. (2006). Mitochondrial dysfunction and oxidative stress in neurodegenerative diseases. Nature, 443(7113), 787-795. (19) Popa-Wagner, A., Mitran, S., Sivanesan, S., Chang, E., & Buga, A. M. (2013). ROS and brain diseases: the good, the bad, and the ugly. Oxidative Medicine and Cellular Longevity, 2013. (20) Ott, M., Gogvadze, V., Orrenius, S., & Zhivotovsky, B. (2007). Mitochondria, oxidative stress and cell death. Apoptosis, 12(5), 913-922. (21) Spencer, J. P. (2009). Flavonoids and brain health: multiple effects underpinned by common mechanisms. Genes & nutrition, 4(4), 243-250. (22) Boots, A. W., Haenen, G. R., & Bast, A. (2008). Health effects of quercetin: from antioxidant to nutraceutical. European journal of pharmacology, 585(2), 325-337. (23) Boots, A. W., Haenen, G. R., & Bast, A. (2008). Health effects of quercetin: from antioxidant to nutraceutical. European journal of pharmacology, 585(2), 325-337. (24) Saw, C. L. L., Guo, Y., Yang, A. Y., Paredes-Gonzalez, X., Ramirez, C., Pung, D., & Kong, A. N. T. (2014). The berry constituents quercetin, kaempferol, and pterostilbene synergistically attenuate reactive oxygen species: involvement of the Nrf2-ARE signaling pathway. Food and Chemical Toxicology, 72, 303-311. (25) Halliwell, B., Rafter, J., & Jenner, A. (2005). Health promotion by flavonoids, tocopherols, tocotrienols, and other phenols: direct or indirect effects? Antioxidant or not?. The American journal of clinical nutrition, 81(1), 268S-276S. (26) Fraga, C. G., Galleano, M., Verstraeten, S. V., & Oteiza, P. I. (2010). Basic biochemical mechanisms behind the health benefits of polyphenols. Molecular aspects of medicine, 31(6), 435-445. (27) Halliwell, B. (2008). Are polyphenols antioxidants or pro-oxidants? What do we learn from cell culture and in vivo studies?. Archives of biochemistry and biophysics, 476(2), 107-112. (28) Halliwell, B. (2013). The antioxidant paradox: less paradoxical now?. British Journal of Clinical Pharmacology, 75(3), 637-644. (29) Calabrese, V., Cornelius, C., Dinkova-Kostova, A. T., Calabrese, E. J., & Mattson, M. P. (2010). Cellular stress responses, the hormesis paradigm, and vitagenes: novel targets for therapeutic intervention in neurodegenerative disorders. Antioxidants & redox signaling, 13(11), 1763-1811. (30) Calabrese, E. J., Bachmann, K. A., Bailer, A. J., Bolger, P. M., Borak, J., Cai, L., … & Cook, R. R. (2007). Biological stress response terminology: Integrating the concepts of adaptive response and preconditioning stress within a hormetic dose–response framework. Toxicology and applied pharmacology, 222(1), 122-128. (31) Draganov, D. I., Teiber, J. F., Speelman, A., Osawa, Y., Sunahara, R., & La Du, B. N. (2005). Human paraoxonases (PON1, PON2, and PON3) are lactonases with overlapping and distinct substrate specificities. Journal of Lipid Research, 46(6), 1239-1247. (32) Ng, C. J., Bourquard, N., Grijalva, V., Hama, S., Shih, D. M., Navab, M., … & Reddy, S. T. (2006). Paraoxonase-2 Deficiency Aggravates Atherosclerosis in Mice Despite Lower Apolipoprotein-B-containing Lipoproteins ANTI-ATHEROGENIC ROLE FOR PARAOXONASE-2. Journal of Biological Chemistry, 281(40), 29491-29500. (33) Giordano, G., Cole, T. B., Furlong, C. E., & Costa, L. G. (2011). Paraoxonase 2 (PON2) in the mouse central nervous system: a neuroprotective role?. Toxicology and applied pharmacology, 256(3), 369-378. (34) Devarajan, A., Bourquard, N., Hama, S., Navab, M., Grijalva, V. R., Morvardi, S., … & Reddy, S. T. (2011). Paraoxonase 2 deficiency alters mitochondrial function and exacerbates the development of atherosclerosis. Antioxidants & redox signaling, 14(3), 341-351. (35) Costa, L. G., De Laat, R., Dao, K., Pellacani, C., Cole, T. B., & Furlong, C. E. (2014). Paraoxonase-2 (PON2) in brain and its potential role in neuroprotection. Neurotoxicology, 43, 3-9. (36) Devarajan, A., Bourquard, N., Hama, S., Navab, M., Grijalva, V. R., Morvardi, S., … & Reddy, S. T. (2011). Paraoxonase 2 deficiency alters mitochondrial function and exacerbates the development of atherosclerosis. Antioxidants & redox signaling, 14(3), 341-351. (37) Fiorani, M., Guidarelli, A., Blasa, M., Azzolini, C., Candiracci, M., Piatti, E., & Cantoni, O. (2010). Mitochondria accumulate large amounts of quercetin: prevention of mitochondrial damage and release upon oxidation of the extramitochondrial fraction of the flavonoid. The Journal of nutritional biochemistry, 21(5), 397-404. (38) Altenhöfer, S., Witte, I., Teiber, J. F., Wilgenbus, P., Pautz, A., Li, H., … & Horke, S. (2010). One Enzyme, Two Functions PON2 Prevents Mitochondrial Superoxide Formation and (39) Apoptosis Independent from its Lactonase Activity. Journal of Biological Chemistry, 285(32), 24398-24403. (40) Giordano, G., Cole, T. B., Furlong, C. E., & Costa, L. G. (2011). Paraoxonase 2 (PON2) in the mouse central nervous system: a neuroprotective role?. Toxicology and applied pharmacology, 256(3), 369-378. (41) Giordano, G., Tait, L., Furlong, C. E., Cole, T. B., Kavanagh, T. J., & Costa, L. G. (2013). Gender differences in brain susceptibility to oxidative stress are mediated by levels of paraoxonase-2 expression. Free Radical Biology and Medicine, 58, 98-108. (41) Costa, L. G., Garrick, J., Roque, P. J., & Pellacani, C. (2016). Nutraceuticals in CNS Diseases. Nutraceuticals: Efficacy, Safety and Toxicity. (42) Chang, Y. F., Hsu, Y. C., Hung, H. F., Lee, H. J., Lui, W. Y., Chi, C. W., & Wang, J. J. (2009). Quercetin induces oxidative stress and potentiates the apoptotic action of 2-methoxyestradiol in human hepatoma cells. Nutrition and Cancer, 61(5), 735-745. (43) Rosenblat, M., Draganov, D., Watson, C. E., Bisgaier, C. L., La Du, B. N., & Aviram, M. (2003). Mouse macrophage paraoxonase 2 activity is increased whereas cellular paraoxonase 3 activity is decreased under oxidative stress. Arteriosclerosis, Thrombosis, and Vascular Biology, 23(3), 468-474. (44) Boesch-Saadatmandi, C., Pospissil, R. T., Graeser, A. C., Canali, R., Boomgaarden, I., Doering, F., … & Rimbach, G. (2009). Effect of quercetin on paraoxonase 2 levels in RAW264. 7 macrophages and in human monocytes—role of quercetin metabolism. International journal of molecular sciences, 10(9), 4168-4177. (45) Chang, Y. F., Hsu, Y. C., Hung, H. F., Lee, H. J., Lui, W. Y., Chi, C. W., & Wang, J. J. (2009). Quercetin induces oxidative stress and potentiates the apoptotic action of 2-methoxyestradiol in human hepatoma cells. Nutrition and Cancer, 61(5), 735-745. (46) Granado-Serrano, A. B., Martin, M. A., Bravo, L., Goya, L., & Ramos, S. (2010). Quercetin modulates NF-κ B and AP-1/JNK pathways to induce cell death in human hepatoma cells. Nutrition and cancer, 62(3), 390-401. (47) Galluzzo, P., Martini, C., Bulzomi, P., Leone, S., Bolli, A., Pallottini, V., & Marino, M. (2009). Quercetin‐induced apoptotic cascade in cancer cells: Antioxidant versus estrogen receptor α‐dependent mechanisms. Molecular nutrition & food research, 53(6), 699-708. (48) Liang, L., Gao, C., Luo, M., Wang, W., Zhao, C., Zu, Y., … & Fu, Y. (2013). Dihydroquercetin (DHQ) induced HO-1 and NQO1 expression against oxidative stress through the Nrf2-dependent antioxidant pathway. Journal of agricultural and food chemistry, 61(11), 2755-2761. (49) Shih, A. Y., Imbeault, S., Barakauskas, V., Erb, H., Jiang, L., Li, P., & Murphy, T. H. (2005). Induction of the Nrf2-driven antioxidant response confers neuroprotection during mitochondrial stress in vivo. Journal of Biological Chemistry, 280(24), 22925-22936. (50) Liang, L., Gao, C., Luo, M., Wang, W., Zhao, C., Zu, Y., … & Fu, Y. (2013). Dihydroquercetin (DHQ) induced HO-1 and NQO1 expression against oxidative stress through the Nrf2-dependent antioxidant pathway. Journal of agricultural and food chemistry, 61(11), 2755-2761. (51) Gan, L., & Johnson, J. A. (2014). Oxidative damage and the Nrf2-ARE pathway in neurodegenerative diseases. Biochimica et Biophysica Acta (BBA)-Molecular Basis of Disease, 1842(8), 1208-1218. (52) Arredondo, F., Echeverry, C., Abin-Carriquiry, J. A., Blasina, F., Antúnez, K., Jones, D. P., … & Dajas, F. (2010). After cellular internalization, quercetin causes Nrf2 nuclear translocation, increases glutathione levels, and prevents neuronal death against an oxidative insult. Free Radical Biology and Medicine, 49(5), 738-747. (53) Saw, C. L. L., Guo, Y., Yang, A. Y., Paredes-Gonzalez, X., Ramirez, C., Pung, D., & Kong, A. N. T. (2014). The berry constituents quercetin, kaempferol, and pterostilbene synergistically attenuate reactive oxygen species: involvement of the Nrf2-ARE signaling pathway. Food and Chemical Toxicology, 72, 303-311. (54) Saw, C. L. L., Guo, Y., Yang, A. Y., Paredes-Gonzalez, X., Ramirez, C., Pung, D., & Kong, A. N. T. (2014). The berry constituents quercetin, kaempferol, and pterostilbene synergistically attenuate reactive oxygen species: involvement of the Nrf2-ARE signaling pathway. Food and Chemical Toxicology, 72, 303-311. (55) Ishikawa, Y., & Kitamura, M. (2000). Anti-apoptotic effect of quercetin: intervention in the JNK-and ERK-mediated apoptotic pathways. Kidney international, 58(3), 1078-1087. (56) Mattson, M. P., & Cheng, A. (2006). Neurohormetic phytochemicals: Low-dose toxins that induce adaptive neuronal stress responses. Trends in neurosciences, 29(11), 632-639. (57) Mariño, G., Madeo, F., & Kroemer, G. (2011). Autophagy for tissue homeostasis and neuroprotection. Current opinion in cell biology, 23(2), 198-206. (58) Qu, L., Liang, X., Gu, B., & Liu, W. (2014). Quercetin alleviates high glucose-induced Schwann cell damage by autophagy. Neural regeneration research, 9(12), 1195. (59) Kim, H., Moon, J. Y., Ahn, K. S., & Cho, S. K. (2013). Quercetin induces mitochondrial mediated apoptosis and protective autophagy in human glioblastoma U373MG cells. Oxidative medicine and cellular longevity, 2013. (60) Maso, V., Franchi, G., Nowill, A., Vassallo, J., Latuf Filho, P., & Saad, S. T. (2013). Quercetin Induces Autophagy, Apoptosis and Cell Cycle Arrest In P39 Cells. Blood, 122(21), 5042-5042. (61) Wang, K., Liu, R., Li, J., Mao, J., Lei, Y., Wu, J., … & Huang, C. (2011). Quercetin induces protective autophagy in gastric cancer cells: involvement of Akt-mTOR-and hypoxia-induced factor 1α-mediated signaling. Autophagy, 7(9), 966-978.